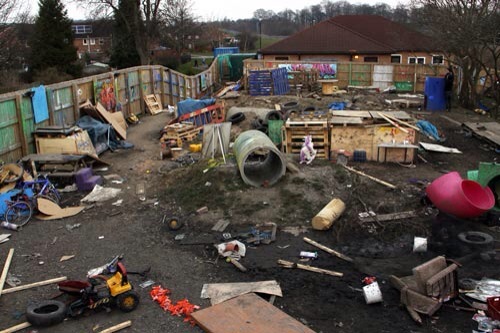 What is an adventure playground anyway? Well, it looks a little like a junkyard, with lots of loose parts. I recently attended a screening of “The Land” by Erin Davis. This event was put together by a local group, MUD, encouraging discussions in our community. It explores the concept of an adventure playground in Wales.Click here for Erin Davis interview. The idea is that children are free to take risks with a variety of materials and experiences, with limited guidance. Play workers are there to remove hazards, but offer no interference or intervention unless there is a request or hazard. (A hazard refers to something that the children are unaware of like broken glass or nails). After the film, there was a bit of discussion about this concept and how to make it work here. One of the questions that came up was how to circumvent legal issues that could arise. The panel answered this by saying that the adventure playgrounds in use are offered primarily to children age 6-11. There are fewer rules and restrictions in this age group. A fence with a lock is also traditionally included so that play workers are there to prevent hazards from harming the children, and to encourage risk taking in a physically and emotionally safe space. A large portion of the audience were families, and while there were a lot of great conversations among parents, the early educator perspective was not present. That’s why I’m writing this…I have something to say as always. We want to encourage risk-taking too. Unfortunately, we have state regulations and insurance liability to worry about. I’m speaking mostly as a home provider, because if our insurance company doesn’t like our space or practices, they will drop us as clients-not just the childcare policies, but home and auto as well. So that means no fires, no water deeper than 24″, and no heights greater than 36″. That’s just to please my insurance company, the state regulations aren’t as tough, but no standing water, all sand covered when not in use…so basically our play space has to be picked up every afternoon. But that doesn’t mean we can’t adopt some basic concepts of the adventure playground: risks are encouraged with minimal redirection and interference, loose parts are offered, and children are able to experience and witness disappointment, failures, achievements, and successes. What do they gain from this type of play? So think about your experiences with playgrounds in the future, and maybe adjust your thinking a little. Children are capable of so much, let’s see how far they can go! And as always, I welcome your comments! A backyard like that is disgusting. You can call it whatever you want but yes, it looks like a dump. I don’t want my children playing in a dump. Everything you said it is good for you can get the same experience with a cleaned up yard. I can’t believe people fall for such BS! JenniferCyrFamilyChildCare · My experiences working with young children shared.